********What is your favorite type of donut? Tell me and enter for a free giveaway! It's that time of year again, Chanukah, Latkes and Donuts abound. I get a kick out of the December food and women's magazines, wherein there are about 60 pages of x-mas themed recipes and a token page with the same old latke recipe. In recent years I've noticed recipes for sufganiyot, or jelly donuts sneaking in to those pages. While in the United States latkes are the fried food of choice for the holiday, the Israeli favorite sufganiyot have made inroads across the Atlantic. Last year I had great success with my Gluten-Free Bisquick Donuts for Lillie. However, they contained eggs so they were a no-no for Rosie. So I had two separate pots of oil, two different doughs, and separate jelly-squirters to accommodate Lillie's egg containing gluten-free donuts and Rosie's glutteny vegan donuts. Since I'm not a big fan of deep frying to begin with, and even take the precaution of wearing safety goggles and shooing small children out of the kitchen, having two pots of boiling oil going on the stove at once nearly gave me a nervous breakdown. So this year I wanted a gluten-free and vegan donut all in one. Good luck to me! I bought a great little book entitled, Doughnuts: Simple and Delicious Recipes to Make at Home by Lara Ferroni --it's worth buying just for the luscious pictures. But in addition to the traditional donut recipes, it contains two types of gluten-free and vegan recipes, but not gluten-free and vegan in the same recipe. I considered fooling around with them to make an amalgam. But after a disastrous first attempt at making GF and Vegan yeast donuts (although the kids still ate it...roll anything in confectioners' sugar and they'll eat it), I wanted a sure thing. Since my favorite all time donut is a chocolate cake donut, I decided to aim for that. Much to my surprise I found that cake donuts are actually fried. Different than yeast raised donuts, they are denser and, as the name suggests, cake like. Through my experiments I found the baking powder batter was preferable than a yeast raised one for gluten-free donuts. I decided to make my life slightly less complicated and just use cake batter in donut shaped baking pans (you can get these at most craft or housewares stores). I used my favorite gluten-free and vegan cake recipe from The Allergen-Free Baker's Handbook by Cybele Pascal. I poured the batter into a big ziploc, snipped about a one inch hole from one corner and easily piped the batter into the non-stick pans. The next day I let the girls frost and decorate them with a variety of sprinkles. They had a ball and my floor looked like the French Quarter after Mardi Gras, but it was a fun day-off-from school activity for them. I used a very simple ganache for the glaze and they looked like donut store donuts! Yes, I had liftoff. But the gluten-free and vegan fried donut still alluded me. A great cookbook I came across called, My Kid's Allergic to Everything Dessert Cookbook by Mary Harris and Wilma Selzer Nachsin, had an oat flour based doughnut hole recipe. Hmmm. The book contains recipes free from (or has subs. for) wheat, eggs, dairy, soy, corn and nuts. It gives substitutes for some other common allergens, like chocolate. Although it does have some glutenny flours as options, there is a handy-dandy chart at the beginning of the book, which breaks down flours from very sticky to non-sticky, as well as a chart showing which flours work best together for different varieties of baked goods. What I like best about this book is that the recipes were developed by mom's of food allergic children, and they are very easy, doable, and appealing to children. I mean what kid wouldn't want to eat a Booger Cupcake?! I paired the oat based doughnut hole with a maple glaze from Lara Ferroni's book, and voila I had achieved a great gluten-free and vegan (if agave instead of honey is used) donut that was quick and easy to make to boot! I took the liberty of subbing an all-purpose gluten free flour blend (I used Jule's brand) for half the flour in the recipe and used oat flour for the rest. The combination of the oat flour and maple glaze gave it such a homey, warm flavor---perfect for a cold winter's day. The publishers, Chicago Review Press, have very generously sent me a copy of this great book to give away to one lucky reader. In the comments section below, tell me your favorite type of donut. Be sure to enter with a google ID, or leave your e-mail or web address so I can be in touch with you if you win. 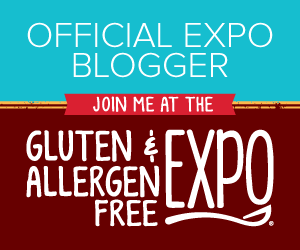 Or, you can tweet me at @glutenfreemaven with your favorite choice. You have until January 15th 2012 to enter. The winner will be chosen at random. I found that I needed to add a bit more liquid than the recipe called for. This could be due to variations in the type of flour I chose. I added more club soda (ok really I used plain seltzer) slowly until the dough stuck together. You want more of a bread flour consistency than a cake batter. Try dipping in one of the two glazes below. They are really amazing when served warm. Make a lot...they go quickly! Note: I have made some changes to the text to simplify the instructions. In a deep fryer or large pot, heat 3 cups oil to 375F degrees. In a large bowl, whisk together the flour, salt, and spices. Mix the baking powder with the club soda. Stir into dry ingredients. Add remaining ingredients and mix until the dough is well blended and smooth. Add additional liquid a tablespoon at a time if needed, until batter comes together. Form the dough into walnut sized balls. Drop balls into hot oil and fry until the doughnut holes are golden brown. Do not crowd them; fry only a few at one time. Remove the doughnut holes with a slotted spoon and drain on paper towels. May be served warm or cooled. When doughnuts are cool to the touch, you may wish to dip in either of the two glazes below, or sprinkle with confectioner's sugar or cinnamon-sugar. Combine both ingredients in a medium sized microwave safe bowl. Microwave on high for 2 minutes. Stir until chocolate is fully melted and mixture is smooth and glossy. Return to microwave for 15 second increments, stirring in between, if chocolate is not melted. Place the sugar in a medium bowl and slowly stir in the maple syrup and milk, a little at a time, to make a smooth, pourable glaze. I love all donuts! I Stumbled this post. I love the Italian Zeppoles. They come out mostly at Easter time in RI. I could pull out my hair. Don't know if it's the yeast or wheat or corn or some or all of them. I am trying a vegan diet for my 11 yr old. I would LOVE a cookbook like this! I like most doughnuts, but I guess I like custard filled with chocolate on top, and jelly filled with powdered sugar. Yum! I love the custard filled doughnuts with chocolate on top! Yum!! Just made these with cardamom as the main spice and covered them with the maple glaze (with a touch of pumpkin-pie spice and allspice added). These are delicious! Thank you for this recipe! Have Your Cake & Eat It, Too! 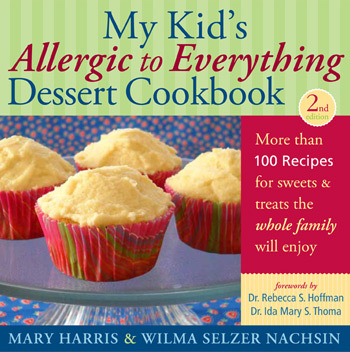 My Kid's Allergic to Everything Dessert Cookbook, 2nd Ed. Secrets of Light Latin Cooking by Alexandra Drijanski, et. al. Not all recipes or products on this site are both gluten-free and allergy free. Regarding specific products, you must read the ingredient label or call the company if you have a specific dietary needs. Not all items shown on website are certified gluten free. Any comment on medical issues is purely personal opinion. Consult your doctor regarding ingredients you can or cannot eat on a specific diet. Regarding kashrut certification on products shown on blog: If you have a question regarding any kashrut certification, consult your rabbi or a reliable kashrut agency.